Torti i Kolaci-Sweet and savory kitchen. : Krap od marinada so mesan zelencuk.//Carp in the marinade with mixed vegetables. Krap od marinada so mesan zelencuk.//Carp in the marinade with mixed vegetables. Krap od marinada so mesan zelencuk e moj denesen recept i predlog za posen rucek.Krap so zelencuk,od marinada e edno navistina mnogu vkusno posno jadenje. Posebno sto krap spadja vo mrsni ribi,sodrzi zdravi masnotiji. Se pomesuva voda malku ocet,sol i maslo,i sitno secen luk. So toa se preliva iscistena riba,taka treba da odstoi nekoe vreme okolu 1 cas za da gi primi mirisite od marinada. za prilog mesan zelencuk i kompiri,i limon isecen na krugovi kako dekorativen element. Kako sto opisav pogore,Krap prvo se mie so ladna voda,se cistat perki so noz,se posoluva i se stava vo marinada. Otkako se se izvadi od marinada se stava vo tava vo koja ce se pece. Vo pekac tava za pecenje prvo se stava maslo,ribata se vadi od marinada i se se prenesuva vo tava. Od strana na riba se dodava mesan zelencuk,se dodavaat i zacini,kako magdonos,vegeta,po potreba i sol,se zasipuva so malku voda. Se redi odstrana i limon isecen na kriski. Se pokriva so kapak pekac i se pece vo zagreana rerna na 200C okolu 45 min. Se proveruva povremeno dali e ispecena riba.Taa brzo se pece,a pri kraj na pecenje, kapak se otvara, za malku vcrvi riba. Da ima onaa ubava crvenkasta kora koja mami so svoj izgled. Se sluzi riba kako glavno vkusno posno jadenje koe si ima i prilog. Carp in the marinade with mixed vegetables. 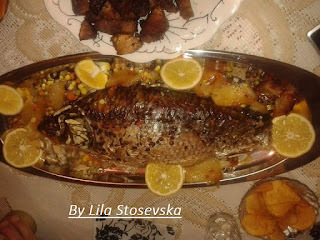 Carp in the marinade with mixed vegetables, very tasty main lean jelo.Its is my today's recipe and a proposal for rucak.Fish with vegetables from the marinade is really delicious especially because carp is one of the fatty fish.This is contains healthy fat. Mix water with a little vinegar, salt, oil, and finely chopped garlic. With this overflow isciscena fish, so be it rest for a while, about 1 hour to acquired odors from the marinade. As a side dish fish add mixed vegetables, and potatoes, and lemon cut into circles as a decorative piece. As I have written above, edge-carp, first wash, cut her fins, with a knife, season with salt and place in the marinade. When you remove the fish from the marinade, put in a baking dish where they will bake. In the baking pans for baking the first place oil, fish download from the marinade into a roasting tin. The schedule vegetables around the fish, add the spices, as parsley, seasoning, the need to add salt fish, and pour a little water. Lemon cut into slices, and make a nice appearance before baking, or after cooking, make eye fish lemon. Indoor eyelids baking dish and bake in a preheated oven at 200C for about 45 minutes. Check from time to time, whether it is over baked fish. This will be a kind of fish bake quickly, at the end of the eyelid open, that little is baked fish, and get a gold attractive color. Then the fish serve as a delicious healthy lean and healthy main course, which already has an attachment.